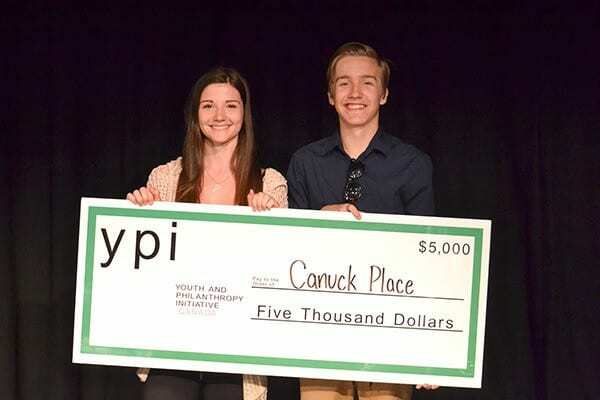 Two Grade 10 students, Kirsten Hartle and Aries Russell from WJ Mouat Secondary School in Abbotsford recently won $5000 for Canuck Place through the Youth and Philanthropy Initiative. Through their Planning 10 course at WJ Mouat, students are tasked with researching social issues in their community, and presenting on a local charity of their choice. Aries believes that the their presentation proved to be the winner due to the personal connect he had towards the program, having seen a friend struggle with cancer. The pair opted to connect with their audience, rather than using a lot of statistics to prove their point, explaining the relevance of the Canuck Place green lights, and scrapbook pages on the mantle. After high school, Aries hopes to attend Capilano University’s theatre program, while Kirtsten plans to attend a local University while volunteering at Canuck Place. Whatever they choose to do after graduation, these two young philanthropists are off to a great start, and have our gratitude for showcasing Canuck Place in such a fantastic venue.